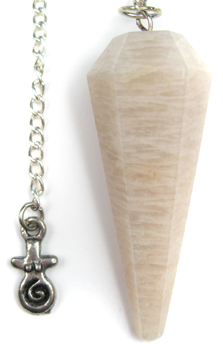 A faceted Moonstone pendulum with a small pewter spiral goddess charm top. Comes with a velveteen pouch. Moonstone: Has healing affinity with stomach, spleen, pancreas, pituitary gland. Unblocks lymphatic system. Relieves anxiety and stress. Aids birthing process, helps female problems. Emotional balancer, helps lessen tendency to over-react emotionally. Flexibility in attitudes. Aligns emotions with Higher Self. Chakra(s): Heart.